Love is definitely in the air. Have you figured out where to take your special someone on Valentine's Day? Share your sweet moments with Teleperformance for a chance to win a travel package, a staycation or a romantic date with your significant other. 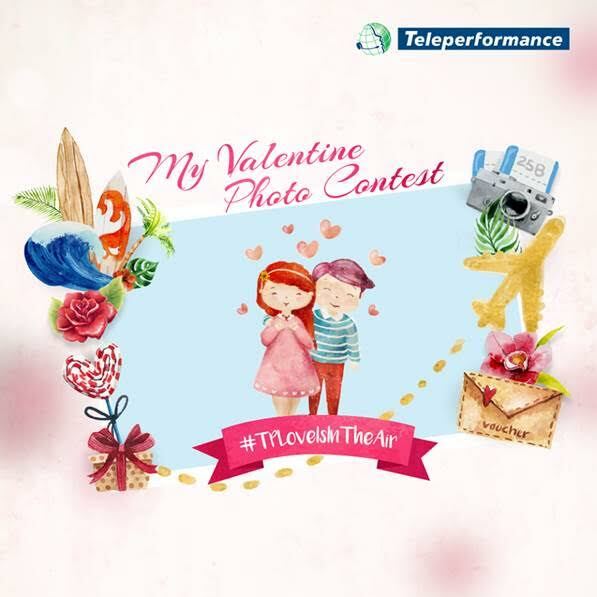 To join the Teleperformance My Valentine Photo Contest, the participant must be at least 18 years old; a permanent resident of the Philippines and must like the Teleperformance Philippines official Facebook fan page within the contest duration. Contest duration is from February 10 to 28, 2017. To qualify, one must take his/her most memorable picture with his/her partner and include a short description of how their love story began (maximum of 100 words). The participant should upload the photo-entry in his/her respective Facebook timeline with the hashtags “#Teleperformance” and “#TPLoveIsInTheAir” on it. The participant should tag the Teleperformance Philippines Facebook fan page in the post. After the photo has been uploaded, the participant should send the link of the post to Teleperformance Philippines official Facebook fan page via private message for verification of the entry. Entries must be submitted from February 10 to 28, 2017. Within this period, the participant should ask their friends to like the Teleperformance Philippines official Facebook page, and their photo entry that were posted on their respective timelines. Photos with large numbers of likes will be reviewed and verified by the Teleperformance Social Media team to make sure all are legitimate and to avoid spams. 1. The photo entry should depict a wholesome and sweet photo of the couple. 2. Photos that display profanity, obscenity, competitor name/brand/logo, trademarked logos, designs and venues that are not fit for public posting will be disqualified. 3. Participants are allowed to use creative filters, frames, and other design elements such as stickers, texts and emoji. 4. A couple may only submit one photo entry (i.e., only one of the couple should upload the photo on his/her timeline). Participants may win only once. The rest of the seven (7) finalists will be given consolation prizes. Representatives from Teleperformance Recruitment, Human Resources, Finance, and the SVP for Human Capital Resource Management will serve as judges. Should disputes arise in the execution of this contest, the decision of the SVP for Human Capital Resource Management of Teleperformance Philippines will be final and irrevocable.